Industrial slurry pumps for dredging, process applications, high viscous material, sludge, muck, paste and high solids applications. Main Applications: Process Pumping, Mining, Wastewater, Chemical, Oil, Sludge, Paper/Pulp, Dredging, Fly Ash Pumping, Coal Ash and more. The Ideal Process Pump for Slurry, Sludge, Grit, Fly Ash, Paste and Scum. We are one of the few companies who manufactures both our pumps and dredging equipment to ensure optimal support. All equipment Powered by EDDY Pump. 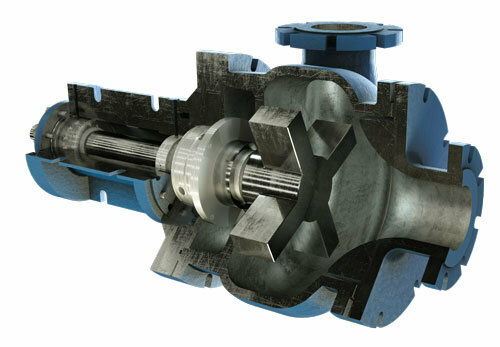 The Best Non-Clog and High Solids Slurry Pump on the Market. Since 1984. Industries Most Served: Mining, Fly Ash, Coal Ash Pumping, Oil and Fracking, Waste Water, Paper/Pulp, Chemical, Energy, Water Districts, Irrigation Districts and Dredging Companies. * Standard performance curve using water. Our pump is specialized for solids, slurry, grit and viscous material. Our water GPM and stats are only listed because there is no industrial standard to measure the material EDDY Pump moves. Contact us to discuss your project and specific material transport requirements. * A majority, 98 percent of our clients use our pumps for non-water applications.